Smokers heal more slowly from broken bones, and are more likely to not recover at all, according to a new meta-study. Smokers had a 15% greater risk of nonunion fractures of the long bones and periarticular long bones. Nonunion fractures occur when the bones fails to ever heal, and often require orthopedic surgery. Smoking could inhibit recovery through narrowing of the blood vessels (vasoconstriction), impaired collagen synthesis, direct inhibition of cell function, and platelet aggregation, according to Mara Schencker, MD, of the University of Pennsylvania in Philadelphia. Schencker and colleagues presented their findings at the annual meeting of American Academy of Orthopaedic Surgeons, according to MedPage Today. The detrimental effect of smoking on the body’s ability to heal may be one reason why smokers are more likely to fare worse after surgery than nonsmokers. They’re also less likely to see the same improvements as nonsmokers when receiving treatment for back pain. In a recent study of patients with spinal disorders, people who quit smoking had marked improvements in pain and disability compared to those who continued to smoke. 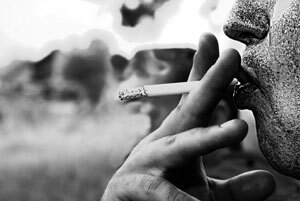 The findings suggest that smoking cessation may improve outcomes for patients with chronic pain and inflammation. Schenker M, et al. “Blowing smoke: a meta-analysis of smoking on fracture healing and postoperative infection” AAOS 2013;abstract 591. Written by: Marissa Luck on March 26, 2013.